Dr. Tendero praises some of the presented researches. Two research fora were conducted once more by the office of the Research Utilization Publication and Information Dissemination (RUPID) in separate dates. First, there was a joint forum between the College of Engineering and Technology (CET) and the College of Architecture (CArch) on September 27. The CET and CArch Research Forum showcased three researches, to wit: an undergraduate research by Arlene P. Delos Santos “Echinochloa Crusgali in a Subsurface Flow System Constructed Wetland; a graduate research by Engr. Roberto M. Sala “Modeling of Maintainance and Operating Costs of Conventional Activated-Sludge Process in Zamboanga City”; and a Faculty Research by Engr. Ilde B. Deloria “Spreadsheet Program for the Design of Septic Tank for Residential Dwelling Units”. 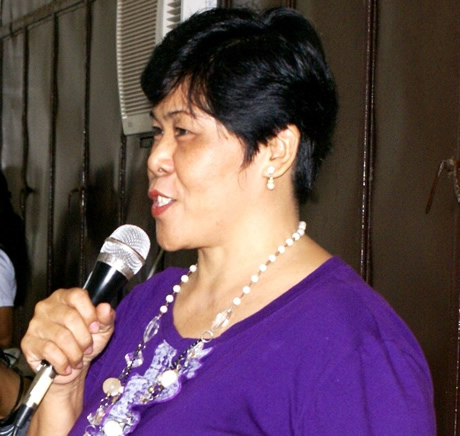 Another research forum was conducted at the College of Home Economics on October 6, 2010. Said forum presented four undergraduate researches, as follows: “Food Intake and Nutritional Status of Selected Retired Government Employees in Zamboanga City” by Annie Rose A. Solo, “Food Intake and Nutritional Status of Patients at the Ward 9 of Zamboanga City Medical Center” by Rogelio C. Eijansantos, “Nutritional Knowledge and Practices among Barangay Nutrition Scholars (BNS) in Selected Barangays in Zamboanga City” by Ma. Carmie R. Algoso, and “Development of Candy from Dried Malunggay Leaves (Moringa Aleifera Lanik)” by Alnahar S. Kunting; and one faculty research “Honeyed Carrot-Kalamansi Nectar Preserved with Gum Traganth” by Prof. Rivera B. Aliponga. “To date, RUPID exchanges journal with Singapore” she added.